Customized marketing gear is effective because it serves as a constant reminder of your brand to your prospects and clients. A custom reusable branded bag will remind your customers about your brand every time they reach for it, but it will also spread your brand’s awareness to everyone your customer encounters while carrying your branded bag. Even if your customers and potential customers don’t read your branding statement and actively engage with your message, just seeing it keeps your brand relevant in their mind. 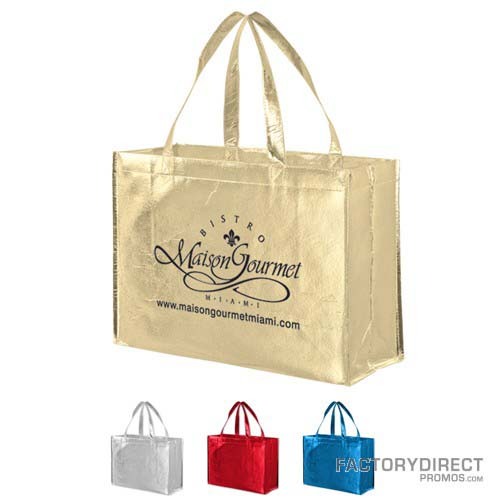 These metallic shopping bags feature a subtle shimmer that ensures your branding statement is seen and noticed. We take safety very seriously. In fact, our products comply with numerous safety standards including California’s Proposition 65, the Consumer Product Safety Act (CPSA), Toxics in Packaging Prevention Act (Tippa), and the Consumer Product Safety Improvement Act. Our reusable bags are tested based on the U.S. Model Toxics in Packaging Legislation. Essentially, the products are tested for Lead, Calcium, and Mercury percentages, and our reusable bags passed and are classified as within the safe guidelines. This means our reusable bags will not contaminate or harm you or your customers. For a full rundown of how our products stack up check out the safety reports. Well-made reusable bags will last and deliver years of consistent use, which means you will get the most bang for your marketing buck and loads of exposure. We work directly with our factory, so we have a high level of quality control. When you place an order with us, we pass your information on directly to our factory. There are no middle men potentially introducing errors, and adding a markup. We also pride ourselves on making our factory a nice place to work. Our factory is ethical and socially compliant. Our workers are never denied their fundamental rights and we do not use or promote child labor. We do provide a safe environment and reasonable hours for our workers in China. Pick the color of the material, the ink color, send us your artwork and we can customize these bags to showcase your message. When it comes to quantity we suggest you overestimate how many you will need. The more bags you distribute the more people who will be out there putting your branding on display. Also, the more bags you order the lower the price per bag, so you’ll get a better deal, and you don’t want to run out. With over 20 years of experience in business and our own factory, we have greater quality control. You can rest assured that you will get your order quickly and everything will be constructed to your exact specifications. Please let us know if you have questions about the design or ordering process, or get your quote! Next Next post: What Is The Problem with Paper Bags?